WPC: How close is too close? That depends on your subject matter! For this week’s challenge I’m including photos taken by a friend of mine, because he captures amazing images of something I won’t. At least not deliberately. My friend, Kenny Sharrocks, along with a few like-minded pals, goes out several times a year wandering through southern Arizona looking for rattlesnakes. And while his pals bring out the latest high megapixel Canons and Nikons, Kenny uses his seven year old Sony H5 series all-in-one with its high powered zoom lens. He tells me he gets better depth-of-field than his cohorts, which is one of the things I admire about his shots. He also captures excellent detail of his subjects, which are almost always found in shaded settings. Kenny doesn’t use a flash, and yet he still gets a nice studio softbox feel to the shots with no post-processing. Another subject he is fond of are the frogs he has come across on his trips to the tropics. For these, he does move in close, using a wide-angle and a ring flash. While my friend prefers small critters for subjects, he is very capable of handling almost any subject matter with his camera. I prefer dangerous subjects that only move fast while they are retreating. Take the black widow, for instance. I was so close to this one that I thought I was going to get a shadow from the lens while using the built-in flash. This is an uncropped shot. In the exploded view insert, you can see that it has brought one of its legs to its open mouth, perhaps for some cleaning. Another fast retreater is the scorpion, which are usually found in defensive locations, waiting for their food to come to them. A white light flashlight will have them hiding quickly, but a black light flashlight will spot them up to 20 feet away, and will not startle them as you get very close. It is very difficult for a camera’s autofocus to work properly under this circumstance, so I turn the focus mode to manual. How about a spider so big, it didn’t get fazed by my presence. The largest wolf spider I had ever seen before this was about quarter-sized, including legs. Sometimes you want to move in close to your subject for dramatic or artistic effect. I wanted to show how big this one was, but realized after the first shot, nobody would be able to tell. I went to grab a metal yardstick and placed it alongside the wolf spider, which sat there the entire time. This was before I had a digital camera, and was taken with a flip-phone. Shooting video in macro mode can be challenging. When I came across these ants in Zion National Park crawling all over this branch, I couldn’t resist trying to capture the frantic pace of their world. The breeze was wreaking havoc with my autofocus, so I switched to manual. At this distance, the branch was still swaying slightly in and out of focus, and I was able to capture better video by moving further back. Enough of the creepy, crawly things, let’s move on to some flowers. Again, special equipment is an option here. The red cactus flower was taken in my mom’s backyard with an android phone. This is straight out of the camera, and was very sharp in an 8×10 print – good enough for mom. Sometimes your best tool for macro photography is patience. This cluster of pink flowers took 45 minutes for me to finally capture sharply. Every time the breeze subsided, I would press the shutter, then zoom in on the screen, only to find that part of it was still moving. About 30 deleted shots later, I finally got this one. The white flower is one I took this spring. In the original, there was a little bit of subdued sunlight finding its way to the background, making for some distraction. This shot was handheld. If I had my tripod, I could have shaded the background completely, and avoided having to do this in post-processing. I have employed the shadowing technique many times, it just requires extra hands and a cable release or remote, along with the tripod. Then there’s extreme close-up without using a microscope. My last shot was one I used for one of Cee’s Challenges, but I’m bringing it back out for this one. 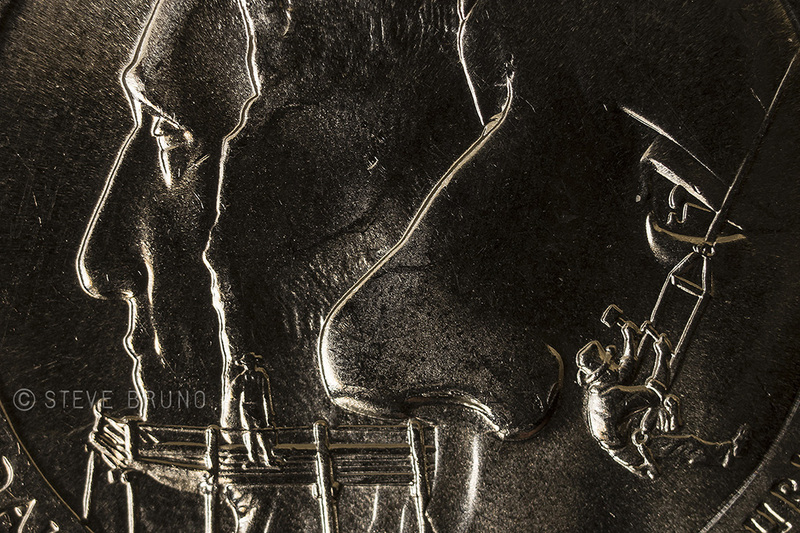 This is an uncropped photo of a 2013 US quarter with the Mount Rushmore tribute. I used a fixed 40mm manual lens and two extension tubes. The extension tubes render the aperture useless and fixed wide open. I wasn’t getting the depth of field I wanted, so I took the lens off, then reattached it, but didn’t turn it all the way into a locked position. This allowed me to change the f-stop and see the result in viewfinder. Similar results can be achieved by using a wide angle fixed lens mounted backwards. Focusing in these situations has to be precise and is assisted by using a focusing rail. That is a darned beautiful rattlesnake. I can do without the spiders though!! Arachnopobe? Yeah!! Beautiful Rattlesnake? Many people would consider that an oxymoron, but I take your side on this one. That’s the reason I had to share it! Absolutely, the textures and color are really wonderful! I would not like to find it in my tent however. Not my idea of a bedfellow, either!